Chestnut Handy Stables is a stable west of the Talos Plaza District of the Imperial City. Although the stables will not sell you a horse, they do provide boarding and lodging services. It is implied that the stable's ostler, Snak gra-Bura, ate the previous stock of horses. If the Horse Armor Pack official plug-in is installed, Snak gra-Bura will outfit any legally owned horse with either Elven or steel horse armor for 500 gold. The first set of armor is free when you hand in the Horse Armor Note. You can persuade her to give you a free Old Nag as well if you have no horse to outfit. 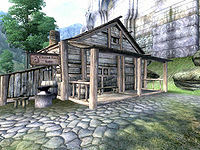 Despite Bongond never leaving North County Stables outside Chorrol, one of the beds in the Chestnut Handy Stables is owned by him. Horse Armor: Protect your horse from danger with this beautiful handcrafted armor.